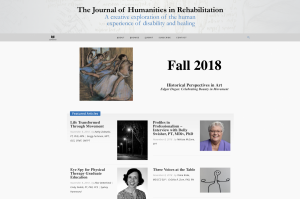 This autumn the Emory Center for Digital Scholarship will launch a newly-redesigned site for the Journal of Humanities in Rehabilitation (JHR) at JHRehab.org. Over the past few months, ECDS’s Senior Digital Scholarship Specialist, Anandi Silva Knuppel, Digital Scholarship Associate, Kayla Shipp Kamibayashi, and Digital Scholarship Assistant and JHR Editorial Assistant, Melissa McCune, have been making updates to the JHR site to create an easier and more efficient experience for readers. 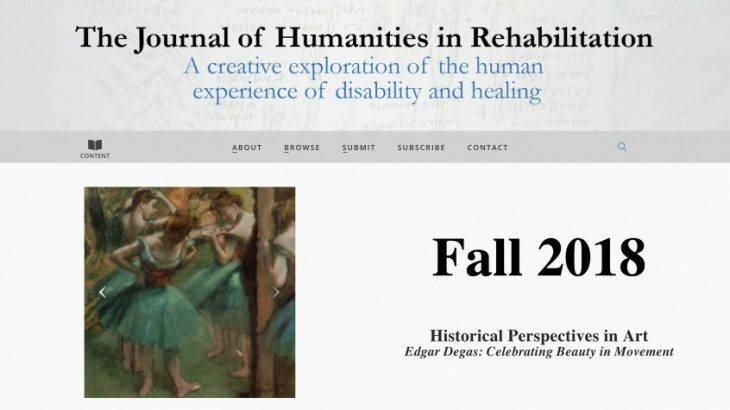 The Journal of Humanities in Rehabilitation (JHR) is a peer-reviewed, multimedia, open-access journal published in collaboration with the Emory Center for Digital Scholarship (ECDS). Since making its debut into the world of digital scholarship three year ago, JHR has brought over 120 clinicians, scholars, educators, artists, students, and patients together to share their voices and bring deeper meaning to the field of rehabilitation. One of these updates is a clean, new home page with easy to find content tabs and other browsing options that make navigating the site feel effortless. Along with an improvement in navigation, the new site also features some helpful tools when reading and browsing; including a progress bar when reading through articles, and a “continue reading” feature that suggests other articles you may find interesting. JHR aims to continue to make improvements in collaboration with ECDS that create an environment where ideas, knowledge, and insights about the human disability experience prosper. stories digital humanities, ECDS, JHR, Journal of Humanities in Rehabilitation, website. permalink.